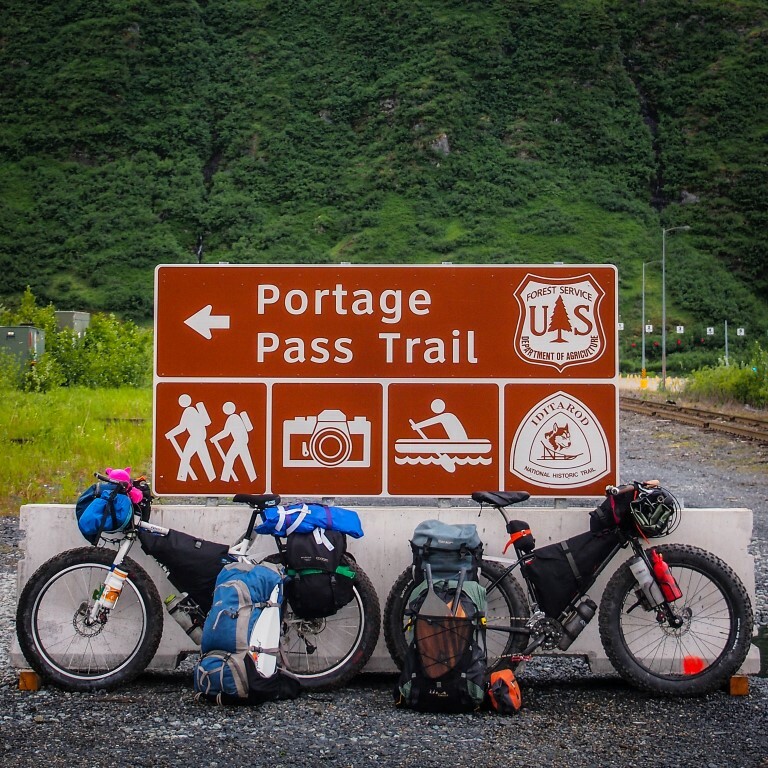 Cycleofaddictionblog – "Save a Bike & Ride the Planet"
"Save a Bike & Ride the Planet"
We didn’t originally plan on riding over Portage Pass to Whittier – why would we? At two miles long, the Portage Pass Trail is shorter than the paddle across Portage Lake to get to it. The original plan was to spend a few hours packrafting to Portage Glacier, but then camping was mentioned. Well, if we’re bringing camping gear, we may as well haul everything, and if we’re hauling everything, we may as well ride to Whittier. Besides, it will make for a great gear – and partnership shake down. I don’t care about the equipment, I just want it to be perfect. I care about the people and history and the culture of the places I visit. I want the gear to disappear when I use it in the sense that it’s so reliable, capable, comfortable (and fun) that I’m only ever in the experience. Earlier this Spring, the amazing crew at Seven Cycles built for me a custom titanium fat bike that is that perfection. Unladen it flies and flicks like a fat bike shouldn’t be able to. Fully loaded it’s every confidence and forward charge. It does everything I want my expedition rig to do. My first shakedown trip was to Alaska in March where I had a pile of fun. I had been planning on going a little further a field on this trip which involved catching a train to Aberystwyth, then riding back home linking bridleways and farm tracks over the Cambrian mountains,Stiperstones and the Long Mynd and on to Stoke, but a house move scuppered my training and in the end I had to be realistic with the state of my fitness.One for another time. I’m lucky to live less than hour’s drive and just a couple of hours ride from the Peak District National Park, so plan B was an easy choice in the end. I’m even more lucky to have two mostly offroad routes into the Peak District. I have used these routes a couple of times now in both directions and they usefully take me in at opposite ends of the Park. The southern route takes you in to the White Peak via the Manifold valley. The northern route takes you into the north-west fringes of the Park around Marple and the Goyt Valley. 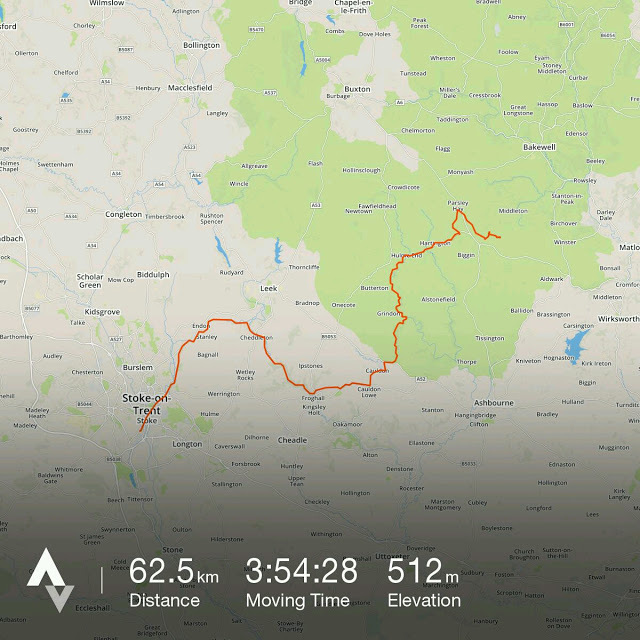 Both of the routes utilise traffic free rail trails and sections of National Cycle Network (NCN).On this trip I was starting at the southern end and travelling in anticlockwise loop through the Peak District. To reach Manifold valley I start from home in Stoke, and get on the the Cauldon canal and follow it to where it terminates at Froghall Wharf in the Churnet Valley. From here It’s a killer 20% road climb but this time I stumbled on a great cheeky trail through a dense woodland. This was a double bonus as it’s a nice bit of offroad and was nowhere near as steep of a climb as the road and a lot more interesting. At first I thought that this must be an ancient road due it being fairly wide and sunken, and there was even a couple of old stone bridges over it at the top.I’ve since found out that it was an old train track that carried limestone from the quarry at Cauldon Low to canal barges at Froghall Wharf then it was transported to the Pot Banks (pottery factories) in Stoke for use in making china pottery and goes as far back as the early days of the Industrial revolution. Once into the Peak District it’s just a case of making a circular route from the two directions trying to link up as much offroad as possible. There is already is a circular bikepacking route around the Peak District in the form of the Peak District ITT route. The Peak District ITT route is one of the now many offroad individual time trail routes/races popping up around the UK, and the rest of the world. If anyone’s reading this and not a clue what an ITT route is I’ll briefly explain. Offroad ITT (individual time trial) routes/race’s can be ridden anytime of the year but mainly they will have a date each year on which there will be a group start. They are totally unsupported,so no outside help other than what can be found on route that everyone else can use. So shop’s,bike shop’s and b&b’s and such are all ok to use. You carry all your own gear & food and resupply when you reach the shop’s in town.Fastest times wins.Simple. Manifold valley follows the river Hamps,a tributary of the River Dove. It’s one of most dramatic of the deep limestone gorges that characterise the White Peak and at about 20km’s (12 miles ) long, is popular with day trippers making use of the bike hire. Thor’s Cave is worth a short stop. Coming about halfway along the trail it’s a huge cavern about 80m (250ft) up the rock face reached by steps cut out of the rock and earth. Remains and artifacts from the stone age have been found in the cave. There was no time for me to stop though this time as the clock was ticking. The sun was dropping fast and I was starting to feel a nip in the air. I stopped at Hulme End, the end of the line,to quickly use the public toilets and put on some arm warmers. I wasn’t planning to stop and camp until I’d picked up the ITT route, but due to my very late start I didn’t leave home until gone 3pm. I was starting to think I might not make it as it was nearly 8pm now and I had about another 15km to go and about 45min of daylight left. I hadn’t bought any lights for the bike and had just a small head torch so there was only one thing for it. I pushed on the pedals harder just as my legs were starting to feel the effects of the days riding. 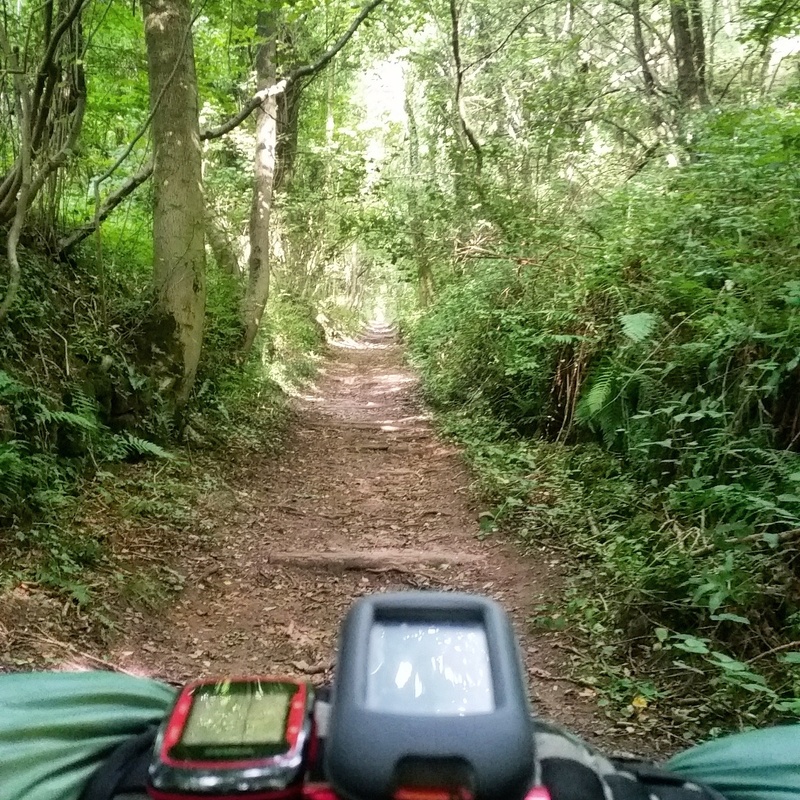 Once I reached the Tissington trail I wasn’t far from a spot I’d wildcamped before on previous trip, I thought about it and dillied for a few seconds but thought no I’m just going to keep the hammer down and make my planned spot. Once I reached the junction with the High Peak trail I was now on the Peak District ITT route. The smooth surface of these rail trails and the gradual downhill enabled me to start hitting 30kph and before I knew It I was at the turning into Long Dale and my planned wildcamp for the night. I hadn’t got a spot in particular planned so I started scanning for somewhere suitable to pitch my tent. I spotted a small woodland up along the top of the Dale, but after dragging myself and the bike up the steep side I found a herd of cattle grazing nearby. Judging by the amount of cowpats and how churned up the ground was, it was obvious that the herd would be making it’s way along here which meant I was going to have to go down into the dale where it would be colder. This was a small concern as I hadn’t bought a sleeping bag with me. 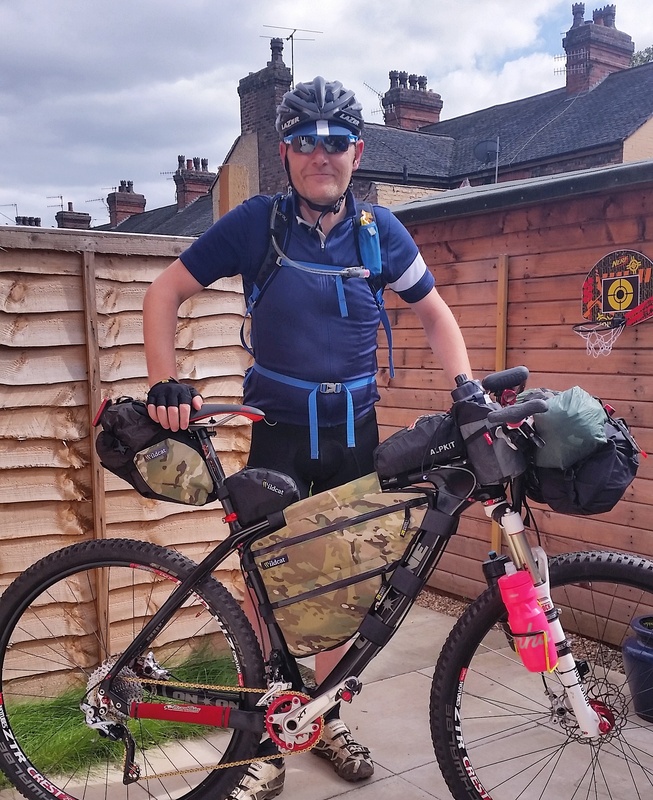 This is a gamble I’ve made before with the aim of keeping the weight/bulk low as my sleeping bag is probably the worst bit of my current bikepacking setup. It’s a heavy and bulky synthetic bag that weighs just under a kilo, about twice what I would like it to be and is top of my list for upgrading. As the kind of bag I’m looking for is going to cost me anything from £200-350 I’m not going to pull the trigger until I’m happy I’ve chosen the right one so I’m still researching to make sure. So without a bag I used a thermal liner with a thermal sheet and wore a down gillet. Anyway I pitched in the dale bottom but as close to the stone wall running along it and under the cover of some over hanging trees with the hope it would give just a bit of extra warmth. I managed to get the tent up and stove on just as darkness fell. Apart from it being a little cold and a bit of painful cramp it wasn’t too bad of a nights sleep and I woke on day two looking forward to the next leg. Shuffle roll over in the tent, check time gather the quilt about, plat glack plat of drops on the fly a continuation of the sounds to which I fell asleep. Logan, whose tent is closest, hears that I’m up and asks whether I’d been outside yet this morning. I pfft at the rain and he suggests I take a look. Unzip the top of the fly, wet heavy snow sluffs off, ground covered and the flakes are falling hard in orderly Euclidean slants. Twelve thousand feet or so, stuttering breath to laugh together through the thin layers of fabric.